Simplicity is our middle name. We absolutely love keeping things simple and easy for you. Which is why you’ll receive your Ohm charges on the same utilities bill you get from SP Group. That's right – one bill for all your utility needs. This is the total amount due for the current month, including Ohm’s electricity charges. You can also find your payment due date here. This section tells you the date of the bill, the billing period, your account type and deposit amount. 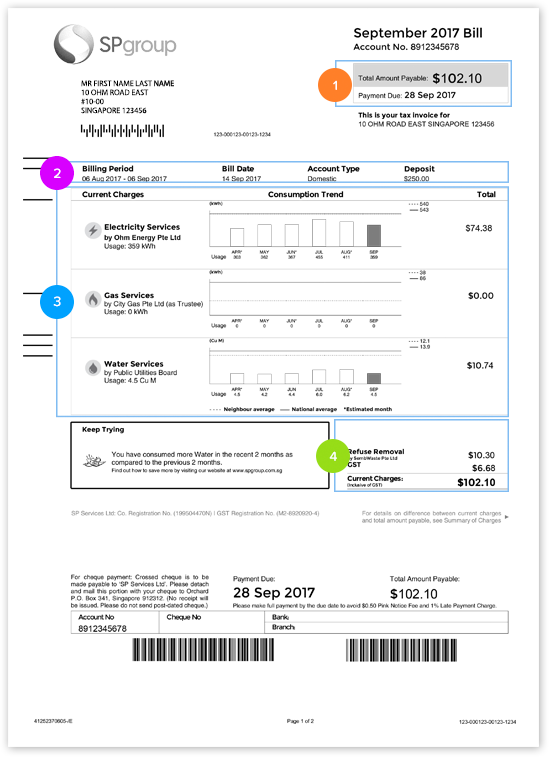 In this section, you’ll find bar graphs, like those in your current utilities bill, that show your electricity, gas and water usage. You can use these to monitor your monthly consumption. This shows the total cost incurred for the current month, before accounting for any outstanding charges. The amount indicated here includes Ohm’s electricity charges. 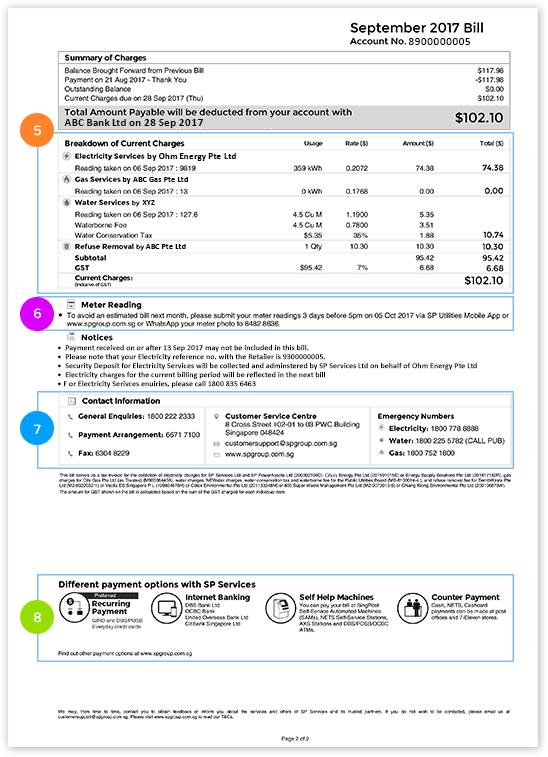 This section shows you exactly how much water, electricity and gas you used during the billing period, along with their respective charges. If you’re on a cumulative meter, your electricity meter will still be read by SP Group once every two months. During the months when your meters are not read, you can follow the instructions here to submit your meter reading, or let SP Group estimate your usage. If you are on an Advanced Metering Infrastructure (AMI) meter, your meter data will be sent to SP Group daily and consolidated into a monthly usage amount. If you have any questions or concerns about your electricity services, send us a message via the Customer Portal or call our Customer Care at 1800-835-6463. Alternatively, you can also get in touch with us using any of the contact information displayed here. Because we’ve teamed up with SP Group, you’ll still have access to all the payment options that SP Group offers.